James Alan Langei, age 43, died along with his wife Sterling aboard his boat in a fire during the early morning hours of March 30, 2012. Jim was born on May 31st, 1968 in Burien, WA to Wayne Allen Langei and Kathryn Lee Langei. He graduated from Auburn Adventist Academy and attended Walla Walla College before graduating from Western Washington University with a bachelors degree in English and a Professional Teaching Certificate. He went on to work for Option Care Home Health before joining Whatcom Educational Credit Union as a loan officer in 2003-present. Jim was married to Susan Peterson from 1989 to 1994 and they had two sons; Spencer Morrison Langei and Ian Copi Langei. He was subsequently married to Laurel Floyd from 1998 to 2005 and more recently married Sterling Taylor on Aug 7, 2010. 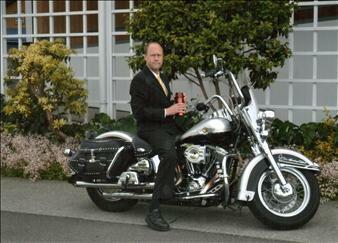 Jim enjoyed riding his Harley and was a longtime member of the Mt. Baker HOG motorcycle club. He was also a member of the American Legion Riders at Post 7, Bellingham. He also enjoyed spending time at his rustic cabin in Maple Falls, vacationing in Mexico and spending time backpacking on an annual “Coast Hike” with his brothers and friends. He also enjoyed spending time with his family at the weekly “Langei Family Dinner”. In addition, he was an avid boater, living on his 42′ 1984 Nova Sundeck “The Breakwind” with his wife who operated America’s Cup coffee shop. He spent his weekends cruising the San Juan Islands and was a member of the Bellingham Yacht Club and Dead Pirates Society. Jim is survived by his parents Wayne and Kathy Langei, brothers Bob and Tom Langei along with their families, and his sons Spencer and Ian Langei (all residents of Bellingham). We will remember Jim as a loving, ever helpful, adventurous father, husband and son whom will be dearly missed.